The plan outlines projected ridership, construction costs, and operating considerations for the build out of a bus rapid transitway along the Highway (Hwy) 61 corridor. 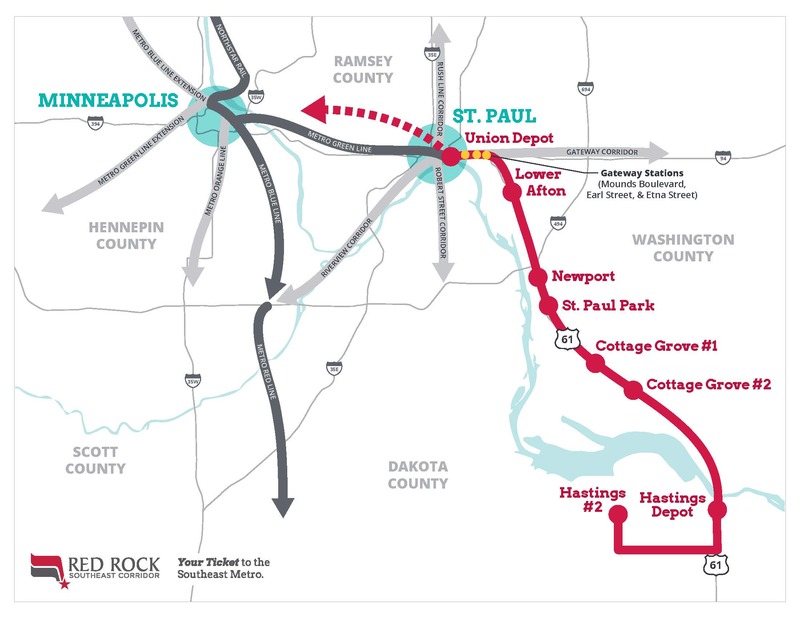 Red Rock Corridor will be the newest transit corridor that connects the southeast suburbs to St. Paul - Minneapolis..
Before an investment can be made in bus rapid transit (BRT), building ridership through expanded bus service and the construction of new park-&-ride facilities in Newport and Hastings will be the top priority. Immediate next steps for the Red Rock Corridor will focus on expanded bus service and promoting economic development at the station sites and throughout the corridor. Advanced transit planning and environmental analysis will also be conducted to further refine the long-term transit solution for the corridor. Q: What is the Red Rock Corridor?